Tuesday October 6th 1896 It was a pleasant morning and I gave the whole house a sweeping and dusting. Will and I went to town in the afternoon, was at Mrs Luse awhile but did not get over the river. Did evening work. Went to bed early. Wednesday October 7th 1896 I had my work down to go to town by eight oclock. It was a lovely day. I went over the river and still got home in time to get dinner. Will and I went down to Birds in the afternoon. Did churning and other work after coming home. 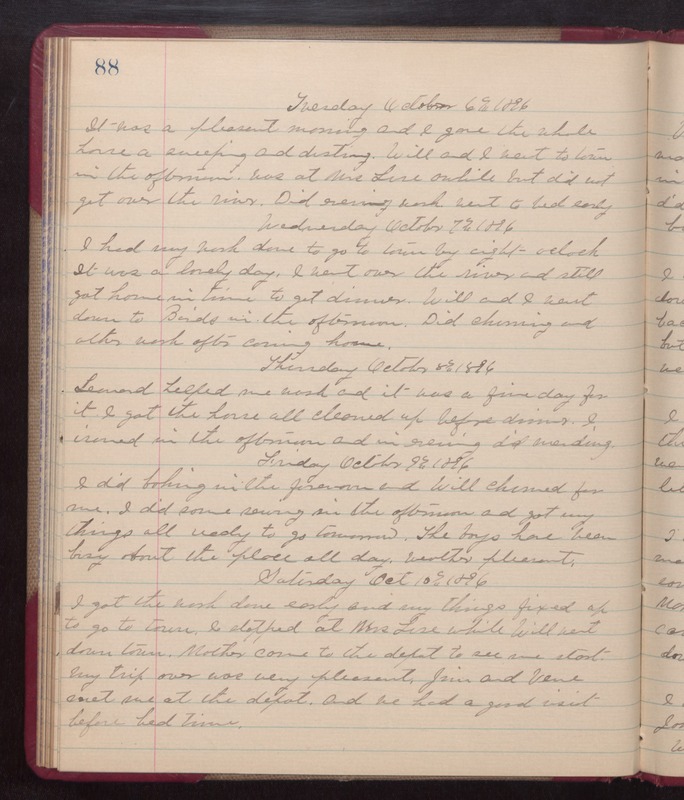 Thursday October 8th 1896 Leonard helped me wash and it was a fine day for it. I got the house all cleaned up before dinner. I ironed in the afternoon and in evening did mending. Friday October 9th 1896 I did baking in the forenoon and Will churned for me. I did some sewing in the afternoon and got my things all ready to go tomorrow. The boys have been busy about the place all day. weather pleasant. Saturday October 10th 1896 I got the work done early and my things fixed up to go to town. I stopped at Mrs Luse while Will went down town. Mother came to the depot to see me start. My trip over was very pleasant. Jim and Vene met me at the depot and we had a good visit before bed time.